← When can correlation equal causation? In this post, I want to deal with what is arguably one of the most common misconceptions about the theory of evolution. Namely, the notion that it requires all species and populations to constantly be undergoing radical changes. You can see this misconception play out in many creationist arguments. For example, creationists often cite living fossils (i.e., organisms that appear essentially the same today as they did in the fossil record) as evidence that evolution is wrong. Indeed, there are entire Facebook pages devoted to presenting examples of organisms that, at least superficially, don’t appear to have changed over millions of years. Similarly, this faulty line of reasoning is on full display in the well-worn creationist trope, “if we evolved from apes, why are there still apes?” The reality is that these arguments are straw men, and the theory of evolution does not require or predict that all populations of all species will constantly be undergoing massive changes. Indeed, there are many well-known reasons why some populations remain stable for long periods of time, and I want to spend this post talking about them. At the outset, we need to clarify our terms and specify exactly what we are talking about. Evolution itself is simply a change in the allele frequencies (i.e., genetic makeup) of a population from one generation to the next, but there are several different mechanisms that can cause that change. I previously devoted a whole series of posts to these mechanisms, so I will be brief here. First, we have mutations. These randomly produce new genetic information for the other evolutionary mechanisms to act on. Usually they are neutral, but sometimes they are harmful (in which case selection removes them) and sometimes they are beneficial (in which case selection increases their frequency). Next, we have genetic drift. This mechanism acts on the existing variation (mutations) in a population, but it is random (i.e., it randomly increases or decreases the frequency of a genetic trait). As a result, it can be harmful because it can remove beneficial traits. In very small populations, it can even swamp selection and cause harmful traits to rise to prominence. Gene flow simply alters the genetic frequencies of a population by bringing genetic material in from a neighboring population. This is often good, because it can provide new genetic material to a population, but it can also be bad, because it can bring in traits that are not adaptive for the local environment. Like genetic drift, high rates of gene flow combined with small populations can even swamp selection. There is heritable (genetic) variation for traits. Those traits affect organisms’ genetic fitness (i.e., their ability to get genetic material into the next generation). Any time that those two conditions are met, selection will occur and the population will evolve. In other words, if some individuals have a genetic trait that lets them produce more offspring than individuals who don’t have that trait, the individuals with the trait will produce more offspring, pass the trait on to their offspring, and, as a result, that trait will be more common in the next generation. That’s all that natural selection is (sexual selection is best thought of as a special case of natural selection). Now that you understand the mechanisms that drive evolution, you should be able to easily think of situations in which evolution won’t occur, or, at least won’t cause substantial changes. Imagine, for example, a large, isolated population (thus limited genetic drift and no gene flow), that is at equilibrium with the environment (thus no selection). Mutations will still occur, but most of them will be neutral, and if the population is already well adapted, majorly beneficial ones are unlikely. Thus, lo and behold, we have a population that undergoes very little evolution. I realize that probably isn’t very convincing to many people, so let’s flesh this out further. Selection adapts to the current environment. This concept is important, because it means that once a population is well adapted to its current environment, there is little left for selection to do. In other words, selection is limited to the available genetic material, so unless a new mutation arises that makes organisms even better suited to the environment, it has nothing to act on. Thus, it simply maintains the traits that are currently beneficial (via stabilizing selection) rather than evolving the population in a new direction. To be clear, it’s certainly possible for a beneficial mutation to arise, but keep in mind that mutations are random and are not influenced by what would help an organism. Further, most of them are neutral, and many of them get lost to genetic drift before selection can act on them. Similarly, new genetic material could come from neighboring populations, but populations are often isolated. A population like this would be described as being in a state of stasis or equilibrium with its environment, and for populations in stasis, only a relatively small amount of evolution occurs. There will pretty much always be some selection occurring just as there will always be some low level of genetic drift and mutations, but populations that have reached an equilibrium like this can persist largely unchanged for millions of years and basically just wobble around a mean value rather than moving in a consistent direction. In other words, some small changes will constantly be taking place, but they tend not to accumulate or form the type of grandiose changes that would be obvious in fossils. Indeed, this is well supported in the fossil record, with species often persisting largely unchanged for millions of years. Nevertheless, various factors can shift a population out of stasis and cause it to undergo rapid change. For example, if there is a dramatic change in the environment, or if a population colonizes a new environment, then selection can act again, because the population will no longer be adapted to the local environment. Thus, a change in the environment can cause rapid evolution, whereas a stable environment can keep a population in stasis (there are lots of other factors that affect whether populations stay in stasis, but for sake of simplicity, I’ll leave it there). What I have been describing here is the concept known as punctuated equilibrium (proposed by Eldredge and Gould), and it is a favorite creationist straw man, so let me briefly set a couple of points straight. First, creationists sometimes portray this as the, “hopeful monster hypothesis,” where rapid changes happen essentially overnight. Indeed, I have seen children’s’ books by Answers in Genesis with silly cartoons, such as a drawing of a pair of puzzled-looking T-rex staring at a hatched egg that has a chicken poking out of it. That is not, however, at all what punctuated equilibrium actually states, and if a creationist presents it to you in that manner, they are either ignorant about basic evolutionary concepts or they are deliberately lying. Either way, you shouldn’t be getting information from them. In reality, when a species shifts out of stasis, selection still goes through its normal steps, with each generation gradually accumulating more and more differences from the original one, and the process still takes thousands or even millions of years to produce dramatic changes. So, the evolution is only “rapid” when you put it in the context of the grand geological time scale of the entirety of earth’s history. Second, creationists often present punctuated equilibrium as a problem for evolution and claim that Darwin was fundamentally wrong, but that is another straw man. Darwin wasn’t really wrong, he was just incomplete. He was absolutely correct about the mechanisms that drive evolution, he just didn’t realize that there are situations in which those mechanisms don’t occur (or, more correctly, don’t accumulate changes). This is very analogous to Newtonian physics vs special relativity. Newton wasn’t wrong, he was just incomplete. His math was spot on and is still taught in every physics course around the world. He simply didn’t realize that there are special cases where his math doesn’t directly apply and other math is needed. Indeed, it would obviously be insane to say that relativity is a problem for physics and discredits the whole field, yet that is exactly what creationists do when they present punctuated equilibrium as a problem for evolution. It is in no way shape or form a problem for the theory of evolution. We understand what causes large evolutionary changes to occur, and if those causes aren’t happening, then of course large evolutionary changes won’t occur. Indeed, punctuated equilibrium does not say that evolution by natural selection doesn’t occur, nor does it say that evolution by natural selection isn’t the primary cause of the diversity of life on planet earth. All that it says is that there are periods of stasis in which little evolution occurs, and those periods of stasis end abruptly when things like habitat changes or invasion into a new area cause rapid, large-scale evolution. That is simply an expansion of our understanding of evolution, not a refutation of it. To simplify that, Darwin was right about how and why evolution takes place, he was just incomplete regarding its rate. In other words, there are lots of periods where changes accumulate gradually just like Darwin proposed, but there are also periods where few changes accumulate, which is the piece that he was missing. Reaching a point of equilibrium with the environment likely accounts for most of the long periods with seemingly little evolution, but there are other things that can limit evolution as well. For example, low genetic diversity can seriously limit a population’s ability to adapt. Remember, selection and genetic drift simply act on the existing genetic variation, but if there is very little genetic variation, then there is very little for them to act on. Indeed, this is one of the key reasons why conservation efforts for threatened and endangered species often focus on maintaining high genetic diversity. Species with low diversity can’t adapt to environmental changes, new predators, etc. because there is no diversity for selection to act on. Again, this is not a problem for the theory of evolution, because the theory stipulates that selection occurs when there is heritable variation. From that, it also follows that selection will not occur when there is no variation. The finally point that I want to make is that not all populations of a species have to evolve simultaneously. Remember, selection acts on populations, and it adapts them to their current environment. Thus, two populations can both remain stable if they are in similar environments, or one can adapt while the other remains stable if one is in a changing environment and the other is in a stable environment, or they can both adapt in different directions if they are both in environments that are changing in different directions, etc. Thus, there is absolutely no reason why the evolution of a new species requires the loss of the original species. Let me give you an example. Imagine that we have a population of butterflies living on the coast, and one day, a large storm blows a bunch of them out to an offshore island that has a very different environment from the mainland. That population on the island will quickly adapt to the island, and if it continues to be isolated form the mainland, it will eventually undergo speciation (i.e., it will split off from the original species and become a new species). Meanwhile, if the environment on the mainland remains fairly stable, the population there can persist in stasis and retain its original form. Thus, you have the evolution of a new species, without the loss of the original. 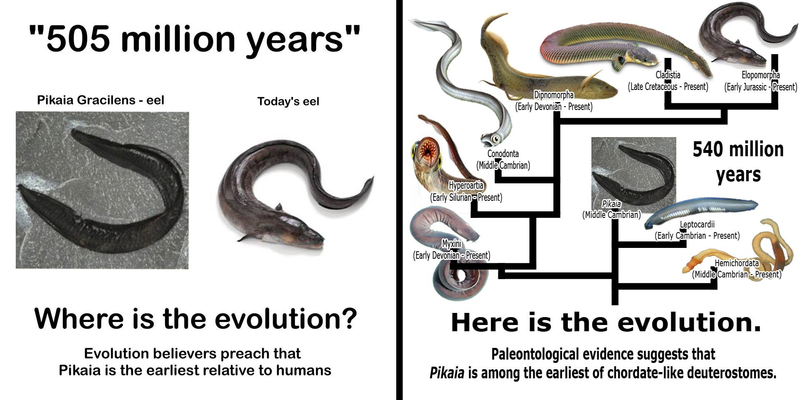 On the left you have a creationist meme arguing that Pikaia gracilens is the same as a modern eel. In reality, it is very different from a modern eel, and as is depicted on the right, there were many other lineages that evolved into our modern animals. The image was made by Here’s The Evolution, a Facebook page devoted to refuting creationists’ non-sense memes. You should, at this point, be able to think of lots of situations that would cause this, and the problems with creationists’ arguments should now be obvious. 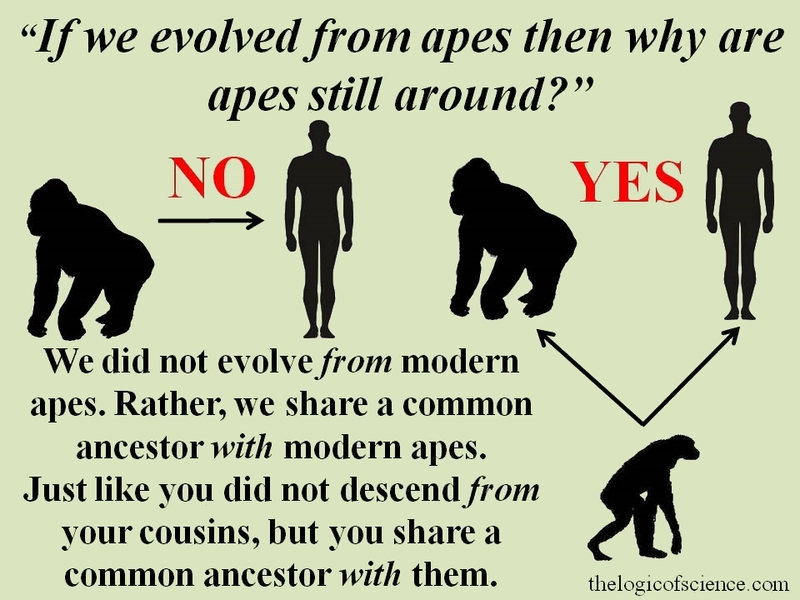 For example, in response to the question, “if we evolved from apes, why are there still apes,” there is no reason why one lineage couldn’t split off and evolve into us, while another lineage remained largely unchanged (also, we share a common ancestor with modern apes rather than being descended from them, so the premise of the question is also wrong). Indeed, the existence of multiple lineages like this is something that creationists often overlook. In other words, when they present an example of something that “hasn’t evolved” they often ignore the fact that there are usually lots of other branches of its family tree that underwent massive amounts of evolution, and the fact that one lineage remained in stasis is in no way a problem for the theory of evolution. In short, there is absolutely nothing in the theory of evolution that requires all populations to constantly undergo large-scale evolutionary changes. Natural selection simply acts on the existing variation in a population, and it adapts populations to the current environment. Thus, in situations where the environment is stable, there is little variation, etc. populations may persist largely unchanged for long periods of time. This is not a problem for the theory of evolution. We understand the factors that cause evolution, and if those factors don’t occur, then of course evolution won’t either. Similarly, there is no reason why all populations of a given species have to evolve simultaneously. If one population is in a stable environment while the other is in a changing environment, then the latter will evolve to adapt to the changing environment, while the former remains in stasis in the stable environment. Eventually, the adapting population will accumulate enough changes that they speciate (i.e., split into separate species). Thus, a new species will form, while the original was retained. Again, this is completely consistent with our understanding of evolution, and it is not at all a problem for the theory. Finally, I want to conclude by pointing out one of the things that I find most frustrating about creationists. Namely, their intellectual dishonesty and complete lack of curiosity. The things that I have been describing in the post are basic, fundamental concepts about evolutionary theory that you would learn in an introductory course on evolution, yet creationists are willfully ignorant of them. Most creationists have no desire to learn what evolution actually says and would rather plow forward with their straw men arguments. To be fair, there are some who eschew these arguments, but they appear to be the minority, and that is tremendously disappointing, because evolution is truly fascinating. Studying it is enthralling, but rather than bask in the glorious glow of enlightenment, creationists cling to their misconceptions and refuse to acknowledge that they have no clue what they are talking about. Note: As always, I want to clarify that I am not making any religious arguments in this post. Evolution is a scientific fact, and I am simply explaining the evidence. There are Christians who both accept evolution as fact and believe in god. Great article sir . I really enjoyed it. Any book recommendations on the topic you just wrote? Any of Stephen Jay Gould’s books would be good places to start. My physical anthropology was a social anthropologist who did not understand evolution. One of the things that made me cringe was when she said that speciation happens when an isolated population diverges from the rest of the species. So far so good. Then she said, then for some reason the parent population changes too. Huh? She was invoking weird action at a distance in evolution. Well, it CAN happen that way. Look at island populations. But that is plainly not the only way it happens. Your teacher didn’t seem to be looking at ALL the picture.